Sun Moon Lake: Recommended for a Two Nights Stay or More. Family Friendly Area, well known for local couples to take honeymoons. As the Taiwanese saying goes, “One has not been to Taiwan, if one has not been to Sun Moon Lake.” After experiencing Sun Moon Lake firsthand, the saying does indeed hold true. Sun Moon Lake is the most beautiful, scenic place in Taiwan for a slow leisurely idyllic return to the countryside, away from the hustle and bustle of the city. This is probably one is the places in the world you can sleep soundly at night without worrying about tomorrow. The beauty of this place will leave you with memorable memories of your loved ones whom you bring along with. 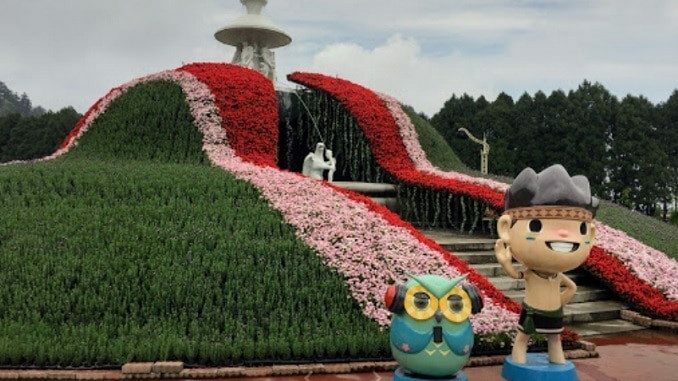 No wonder it is the top honeymoon destination of newly married local Taiwanese couples, although we saw more elderly tourist and families than lovely dovely couples while we are there. If you have ever visited West Lake in Hangzhou, China (2 hours from Shanghai), Sun Moon Lake is definitely more beautiful and romantic than West Lake. There are less crowds, fewer cars, less city-like atmosphere, and it the lake is sited on top of the hills away from all civilization, that you might forget that computers once existed and immerse back into nature. Train from Taipei to Taichung, Transfer Sun Moon Lake. Take the HSR Train from Taipei Main Station. Buy the tickets to Taichung Station (Pronounced as Tai Zhong or Central Taiwan in Chinese). The journey is 45 minutes via Express Service at 1000NT (Business Class) or 700NT for (Economy Class) (Business Class Includes Free Coffee and Peanuts, spacious leg room and dim lights). Transfer Taxi from Taichung to Sun Moon Lake 40 minutes – 1-hour taxi ride for 1500NT Or Transfer Bus from Taichung to Sun Moon Lake 120 minutes bus ride for 200NT per person, one way. Economy Transport from Taipei to Sun Moon Lake. Direct Bus from Taipei Main Train Station to Sun Moon Lake Visitor Center at 10 am 2 pm, and 3 pm (timings subject to change) 4 hours bus ride at $460NT per person one way. Total Time From Taipei to Sun Moon Lake: 2 – 4 Hours. Our Recommendation from Taipei to Sun Moon Lake. We highly suggest to take the high-speed rail HSR Train from Taipei -> Taichung for a fun bullet train ride going up to 300km/h, and transfer to a Taxi with your luggage to stop directly at your hotel in Sun Moon Lake for convenience. The train ride from Taipei to Taichung is only 45 minutes, and upgrading to a business class includes refreshments. Most business people take the train on weekdays, and they usually take a bento box up the train for a snack. You could put on your formal wear to fit in with the crowd. Take note that the locals do not speak good English, and printing your hotel name in Chinese will be useful. Alternatively, ask the taxi concierge to translate your hotel name to Chinese to the taxi driver before going into the taxi from Tai Chung station. If you are a westerner, you might be the only westerner in this area as this is a favorite local travel spot for the Taiwanese and tourist from neighboring mandarin speaking countries such as Hong Kong, Singapore, and Malaysia. Best Dates to Travel to Sun Moon Lake – Weekdays. Avoid the weekend crowds, especially on Saturday, and book your hotels on weekdays and Sundays to avoid the jack up rates on Saturday night. On weekdays, it is quiet and enjoyable tranquil countryside, with many shops that open in the day till late nights catering to tourist. Sun Moon Lake is an enjoyable area to take slow walks to admire the mountains and lakes and it is best done without the crowds. Sun Moon Lake Cable Car Ride. We would recommend taking the first cable car at 10 am and return at 4 pm as the cable car service stops at 4 pm. The cable car ride offers panoramic views of Sun Moon Lake and mountains, and it is one of the most beautiful cable cars rides that you ever experience in your lifetime. The cable car ride is very high up the mountains and it is not for those who are afraid of heights, especially when it slides downwards from the hills to the cable car landing. The cable car stops at two destinations: The Formosan Aboriginal Cultural Village and Amusement Park. The cable car area covering the Formosan Aboriginal Culture Village, Theme park and European Gardens is huge, and it is unlikely it can be covered in one day. It will take about two days to visit all the attractions. Cable Car Stop 1: Formosan Aboriginal Culture Village. The aboriginal cultural center features daily shows at different timings by the native aboriginal people performing traditional dances in their unique costumes. Their costumes are intriguing, women carry a hand-woven tiny basket behind their waist, along with flower garlands and intricate hair pieces and hand-woven fabrics. The men wear feathers on their headgear. The dances relate to us in the sense that we, advanced humans from the 21st century are no different from aborigines, and are similar in many ways, and have similar wants and needs, just in different contexts. (example, women now carry branded bags instead of hand-woven baskets, and men wear watches to show their social status instead of feathers). You can purchase their native hand made costumes at the tourist shop near the show areas to support the local aborigines. Cable Car Stop 2: Aboriginal Theme Park. Care for a log flume ride in the middle of two hills in Sun Moon Lake? This area is quite remarkable that a theme park can be built out of nowhere, as the theme park is surrounded by rowing hills and greenery with no town or cities in sight. There are roller coasters that go 360 degrees, a free-fall ride called UFO Adventures, and even a Space Mountain, similar to what you ride in Disney Land in Tokyo. This is a great place for a family outing. The best way to experience Sun Moon Lake is no other than by the water itself. Hop into a ferry boat at only 200 NT unlimited rides per person with a frequency of 15 minutes departure at all 4 stops. The boat is quite stable and modern, no sea sickness will result from the short trips around the lake (10 – 20 minutes between each stop). You will cover most of the attractions in Sun Moon Lake with the connecting boats to different parts of the lake. One of the stop highlights is a Temple with a store that sells the best Herbal Tea Eggs. Every Taiwanese knows where it is, and recommends all visitors to try an egg personally. A local taxi driver shared that the store sells about 20 000 herbal tea eggs a day! To get up the temple (and herbal tea eggs), you would have to climb a fleet of stone stairs up to the hill. Feeling tired at the top, you can finally reward yourself with an egg and beautiful views of the lake and mountains before going downslope back to the ferry area. Search and compare more hotels near Sun Moon Lake.